Baymont Inn and Suite is a hotel marked by great accommodations and luxury at a surprisingly affordable cost. A wonderful atmosphere and a cozy hospitality will satisfy every guest to the fullest. The hotel was built in 1989. There is an outdoor swimming pool facility and complimentary access to a nearby fitness center. The three-story building has 134 rooms. 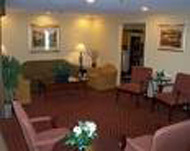 Rooms at the Baymont Inn are spacious, neat and clean. Local calls are free as is wireless internet access. The Wilmington airport is eight miles away and there is an Outback Steakhouse adjacent to the hotel.